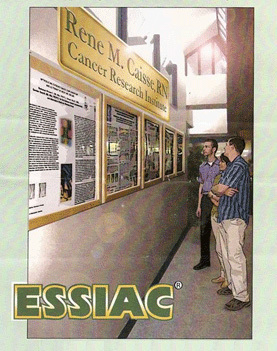 TORONTO, January 9, 1998: The Canadian College of Naturopathic Medicine (CCNM) is pleased to announce that Essiac® Canada International has donated $250,000 to the college for a new restricted capital fund. This fund will be used to develop a state-of-the-art Learning & Information Resources Centre at the college, specially focusing on building the botanical library collection. This focus is very appropriate since Essiac® is an herbal formula developed by nurse Rene M. Caisse from Bracebridge, Ontario. The Essiac® Botanical Collection will include electronic data bases (including CD ROM and Internet), indexes, periodicals and texts. The collection will be assembled over a five-year period. A task force, comprised of staff, faculty and students, and headed by Chris Pilgrim, vice-president learner services, will be working to develop acquisition guidelines for the new collection. "I appreciated the opportunity that CCNM president David Schleich gave us to participate in building the botanical collection for the Resource Centre," says T.P. Maloney, president of Essiac® Canada International. "It will become the most comprehensive collection in North America and an invaluable reference for students not only at CCNM but students at the other naturopathic colleges in the United States too." CCNM president David Schleich says "We are just delighted with the opportunity to expand our botanical collection for use by our students and by licensed naturopathic doctors in the field. We are confident it will become the pre-eminent botanical library collection in North America. With the generous contribution of Essiac®, they have made a possibility become a reality." Web site owners shall require written permission from Altramed H P. Inc. before creating second part internet links to their sites. This is to insure that Altramed H P. Inc. is not connected to other web sites that are in violation with the Canadian Health Protection Board of Canada and/or the United States FDA. Web sites refusing to remove links when asked to do so, may be subject to legal action. Copyright © 2008 Altramed Health Products Inc. All rights reserved.